Certain responsibilities lie with the shipper for all LTL and TL shipments. These responsibilities apply across the board with all freight carrier companies. Proper packaging, address labeling, shipment loading and unloading, and proper shipment documents (BOL provided to you by us) are required by all carriers and are the responsibility of the shipper. These are things that your shipping agent will assist you with, but you can get a good idea here on the web site of what to expect, along with some resourceful ideas on packaging and other need-to-know info. Packaging, in most cases, will be the main protection (insurance) against shipment damage (unless factory new/factory packed). All the insurance in the world won't protect an improperly packaged shipment from damage. The main thing to remember is to use your best judgment when packaging an item for shipment. Delicate items should be packed on a stable base and covered in a way to eliminate exposure to scratching or dinging. Crating, pallets, and heavy gauge cardboard should be considered for delicate items. Heavier, touger items (like a cast iron stove, for example) wouldn't need to be packed so carefully, but mobility must still be kept in mind. Your best judgment applies to packaging all the many millions of items currently being shipped across America. Don't worry, our shipping agents are available to assist you through the entire shipment process, from the moment you decide to ship until your shipment reaches its destination. Just give us a call! Proper address labeling is not that big of an issue; anyone who has ever mailed anything through the US Postal Service knows how to properly label a shipment. It's as simple as where it is coming from and where it is going to. Shipment loading and unloading is also the responsibility of the shipper. When using commercial or terminal locations with a loading dock, this is not an issue. But for residential pickup and/or delivery this is a detail to be considered. In many cases you may want to plan on having friends, relatives, or neighbors on standby to help with the loading and unloading. In some cases additional services such as lift gate may be required, but the additional costs are to be considered. Always remember a "truck driver" does just what the title implies: drive the truck. 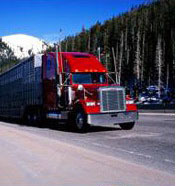 The driver is never responsible for loading or unloading, although under reasonable circumstances he or she may help. It all goes back to using your best judgment. Proper shipping documents, presented to the driver at the point of origin, are also the responsibility of the shipper. These documents, along with simple instructions, will be made available to you by your shipping agent.